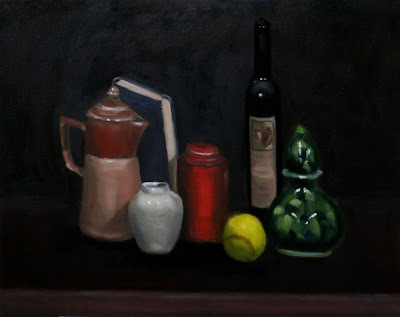 Today, I worked on a wine bottle and a green jar. What I found really fascinating is his eyes for details. For example, he taught me how to paint eclipse in three dimensional way. That is, the way the curved lines should be receding in a gentle, round way. Say, a green jar on the right. The top of the base, which you can see as bright eclipse line, was initinally very pointy at both ends, and the same tone all around. Based on his suggestion, I rounded both corners so that edges looks going around backwards, and I darkened the edges. It's amazing how things look so different with a touch of a brush stroke. Greg said that I'll start a new painting next week, so, this one is considered finished. Although the background needs more work, this is my first ever still life painting.